Mantaro Original Peruvian Cuisine is the third installment in my Scout Tobias restaurant series. We went there during lunch time, the place was small yet it was packed with families having their Sunday lunch. There was a vacant table in the air conditioned area but the door was kept open. When we went inside, we understood why. The exhaust can't handle the smoke coming from the open kitchen. Luckily, there's an Al Fresco/Veranda area so we opted to sit there instead. As we perused the one page menu, we can't understand a single word written presumably in Spanish. A woman approached our table and rattled off the English translation one by one. She said it so fast that DH was not able to understand a single thing. When she sensed that we were still dilly-dallying, she hurriedly left our table. When she came back, we were ready for our orders. Unfortunately, she didn't get all our orders right. We ended up with only two dishes- Pescado Al Ajillo and Lomo Saltado, instead of three. Tomahawk was left out. I remember DH saying, "I don't like beef and chicken". The only pork on the menu was Tomahawk and sadly, it didn't come out of the kitchen. One order, Ceviche De Pescado (Php 320), came out (not in the photo) but we didn't order it and politely requested the waitress to return it. Why? Because it was raw, prepared like "kinilaw". Most of the items under Appetizers are raw except for Chorizo Al Plato (Php 220). 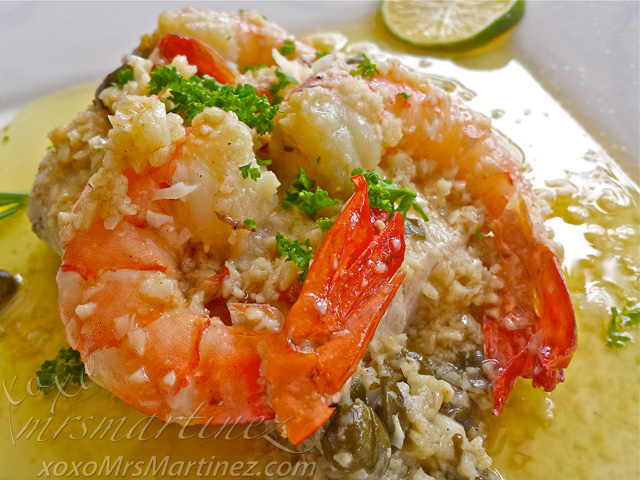 Pescado Al Ajillo has three huge Tiger Prawns on top of Mahi-Mahi. The prawns were slightly undercooked. I don't know if that's the way it should be but I like my prawns to be cooked just right. So, yeah, I squeezed all the juice I can get from the slice of lime provided on the side. 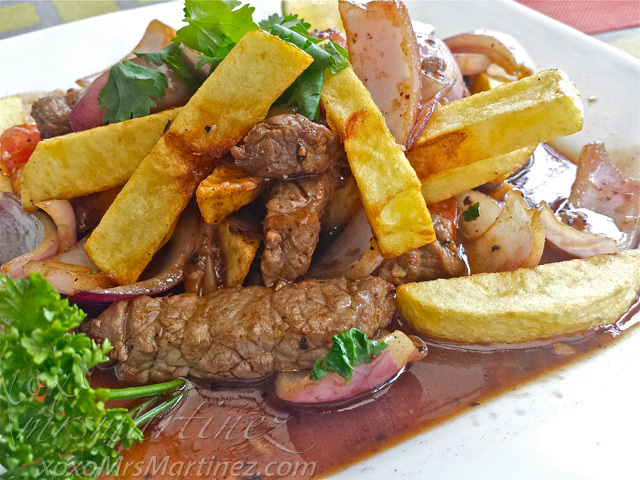 My daughter was not able to eat the prawns but she was able to eat the fries served with Lomo Saltado. The beef was not as tender as I was expecting it to be. It was a bit chewy and the taste was a little bit salty. The restaurant's signage is inconspicuously tucked under a huge awning so Mantaro is easy to miss when you are not familiar with the vicinity. As with any other restaurants around the area, only street parking is available. Other Scout Tobias restaurants are The Round Robin Cafe and 49-B Heirloom Kitchen. Mantaro The Original Peruvian Restaurant is located at 57 B Scout Tobias corner Scout Limbaga, Quezon City 0905 2299605.